Liczba stron: 62 Jest to ujednolicona liczba stron, która ułatwi Ci porównanie długości książek. Każda strona Legimi to 200 słów. Jesus gave people a wonderful game – chess! The game is very popular around the world because it helps a person to learn how to make informed decisions: certainly necessary in this modern and complicated world!During 25 years of coaching, I have helped more than 600 boys and girls to learn how to make their first chess moves. Among them was the present world chess champion among people with disabilities Alexei Smirnov (FIDE ID 4168437, FIDE Elo 2451).The methods for learning the basics of chess which are set out in this book have been repeatedly tested and brought excellent results. 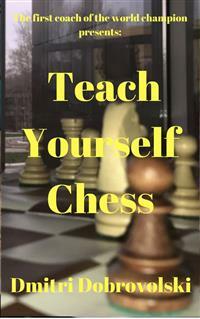 The material is given in a simple and effective way so that Teach Yourself Chess can be used by a person of any age who can read.For this tutorial, the only requirement is a chessboard with its pieces so that the reader can apply theoretical information immediately. This tutorial can be successfully used by parents who want to teach their children the basics of the game.I am sure that this book will be useful for school teachers who decide to involve their students in an exciting game. Published by Dmitri Dobrovolski, 2017. First edition. August 7, 2017. Copyright © 2017 Dmitri Dobrovolski. Chess is a game for two people, alternately moving the pieces on a chessboard. So, the light pieces and the same colored squares on the board are called white, while the dark one is called black. The aim of the game is to checkmate the opponent's king. The player who checkmates his/her opponent is considered to be the winner in this game. In addition, the game can end in a draw. The first move in a chess game is made by the player who plays the white pieces. There are a lot of new terms and concepts for you, dear reader, aren’t there? Don’t worry. Soon you will know everything you need to play the game! I suggest we start our exciting journey through the basics of chess! So, what is a chessboard? The chessboard is a squared playing field, which consists of 64 white and black quadrates. These quadrates in chess are called chess squares. In order to set up a chessboard before the game, you must remember this rule: a white square should be located on the right side of the player (Diagram 1). From the chess, squares are formed chess lines. The lines passing from the left to the right are called ranks (Diagram 2). The ranks on the chessboard are denoted by numbers. There are eight ranks on the chessboard. Set up white pawns on the first rank. (Diagram 3). Set up the third, the fifth and the seventh ranks by turn. The lines passing through the chessboard from the bottom up are called files (Diagram 4). The files are indicated by letters on the board: a, b, c, d, e, f, g, h. It must be read as: [a], [bə] [tse] [də], [jə], [əf] [ʒə], [Λsh]. There are eight files on the chessboard. Knowing the symbols ranks and files, we can define the location of any square on the chess board. For example, we define the square е5 on the crossroads of the е-file and the fifth rank (Diagram 6). b3, с5, d7, f8, g6, h4. Lines which across the chessboard and consist of the same color squares are called diagonals (Diagram 7). There are white and black diagonals on the chess board. The diagonals on the board are designated by two extreme squares, thus they are called and written always from the left to the right. For example the diagonal а1-h8 (also called a large black diagonal) and diagonal а8-h1 (called the great white diagonal). These diagonals consist of 8 squares, but there are also very small diagonals, which consist of two squares, for example, а7-b8. There are twenty-six diagonals on the chessboard. , using white pawns (Diagram 8). 2. Construct the diagonal of five white squares called а4-е8, using the same pawns. 3. Make any diagonal of five black squares. Each chess player has to know where the centre of the chessboard is. The centre of the chessboard has a square shape. There are small centres of the chessboard, which consists of four squares d4, d5, е4, е5 (Diagram 9) and an enlarged centre of the chessboard, which consists of sixteen squares. The corner squares of the enlarged centre of the chessboard are squares с3, с6, f3, f6 (Diagram 10). 1. Build a small centre of the chessboard using white pawns. 2. Construct an enlarged centre of the chessboard using white and black pawns. Any arrangement of pieces and pawns on the chessboard is called the chess position (Diagram 11). Arrange the position shown in the diagram. The location of chess pieces and pawns before the game is called a starting position (Diagram 12). 1. Arrange the starting position shown in the diagram. To arrange the correct starting position, first, you should put rooks on the corner squares, then put knights nearby, then place bishops and pawns (on the second rank for the white pieces and the seventh rank for blacks). In order to set up the queen properly, we must remember that the colour of the queen and the square which it stands on is always the same: the queen “loves” its colour. There is only one empty square. You should put the King here. The half of the chessboard taken by the kings in their starting positions is called the kingside (Diagram 13). 1. Designate the kingside as it is shown in the diagram. The half of the board, which is occupied by Queens, is called the queenside (Diagram 14). 1. Designate the queenside as it is shown in the diagram. There is an invisible line between the fourth and the fifth ranks that bisect the board. This line is known as the demarcation line (Diagram 15). 1. Place the pawns as they shown in the diagram (Diagram 16). The demarcation line runs between the white and black pawns.